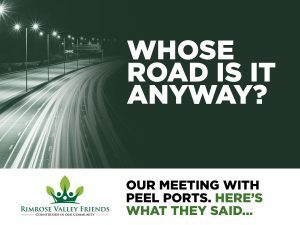 Representatives of Rimrose Valley Friends recently met with Patrick Walters (Chief Operating Officer) and Warren Marshall (Group Planning Director) of Peel Ports to discuss the proposed road through Rimrose Valley. The purpose of the meeting was to explore whether they were willing to support Rimrose Valley Friends and local communities in pushing for better options to be presented to the public in relation to what is officially called the “A5036 Port of Liverpool Access Scheme”. Remember that title, it’s important. We called for the meeting not only because we wanted to give Peel Ports an opportunity to clarify their position, but also for us to convey the message that many within the area view the Port’s expansion as being the main driver behind the requirement for a road in the first place… and therefore hold Peel Ports responsible for what it being forced upon us. Highways England named the project the “Port of Liverpool Access Scheme”, after all. Surely it’s all about them, then? 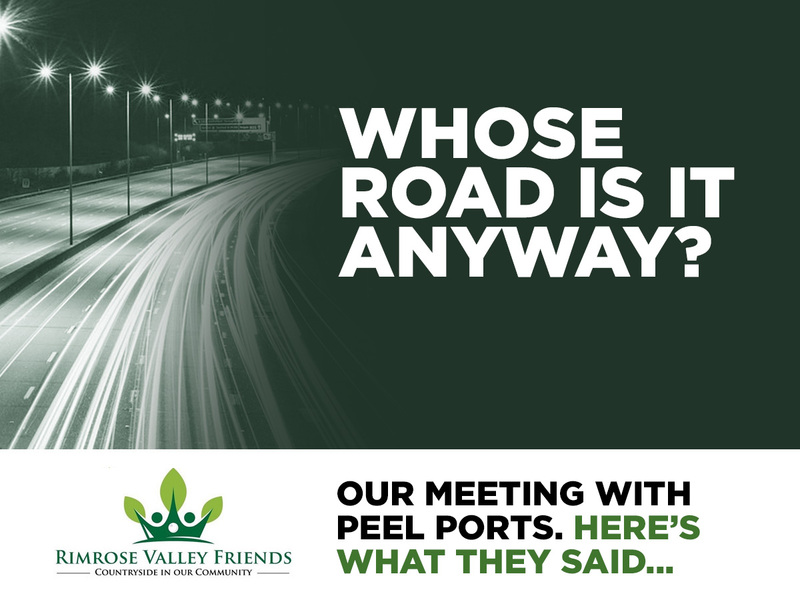 It became apparent that there is very little common ground between ourselves and Peel Ports in relation to plans for the road and that their commercial interests are the overriding factor in everything they do. Yes, once again, we heard that it all comes down to money. As hard as it is to hear, Peel Ports are a private, commercial company. Shareholders are the only people they have to please. No one else. It’s brutal, but it’s a reality we all have to accept. We began by putting it to them that this whole process has been done back-to-front. Infrastructure planning and delivery should have come long before the Port’s expansion was permitted. They said that they feel that loss of market share through not expanding when they did was a more important factor. These are the words of a private, commercial company. It’s what we have to expect. We went on to explain that, from our perspective, the ongoing Judicial Review offered an ideal opportunity for everyone to take stock of how we’ve ended up where we are today and to re-think the approach. We said that, in our view, Peel Ports has a golden opportunity to stand with the community and to become trailblazers in researching and pushing for better alternatives to the movement of freight, as has been the case in leading examples around the world. We wanted to see if they were willing to put some substance to their Corporate Social Responsibility Report and “Live their Values”. We asked if they would fund an independent consultancy (i.e. not one carried out or commission by Highways England) to research all options and to come up with recommendations on how the required end result can be met without such a negative impact on the community. This would enable us to take these viable recommendations to the political decision-makers at Westminster. This is because we strongly believe that there are better solutions out there, we just need people with the skills, resources, vision and ambition to help us explore these fully. We put it to Peel Ports that they could make what is, for them, a small investment in this research that would jump start the process. It could help to create a positive ‘good news’ story for them. In response, Peel Ports said that they will do nothing until the outcome of the Judicial Review is decided. Moreover, Peel Ports aren’t willing to pursue any avenue which may put them at a commercial disadvantage to other ports within the UK. If the outcome of the Judicial Review is that the public consultation process was valid and that a road through Rimrose Valley is to go ahead, it would make no commercial sense for them to help us push for better options. All they would offer would be to support us in pushing for the best mitigation possible. Again, these are the words of a private, commercial company. It’s what we have to expect. When we asked them about the possibility of funding, or even part-funding a better alternative, they confirmed Highways England’s assertion that – having already invested significantly in the Port’s expansion – they have no intention of contributing to the road solution to support it, as they see this as beyond their remit. Again, it’s what we have to expect, although it is an interesting view of a project titled the “Port of Liverpool Access Scheme”. Instead, they suggested that it is perhaps down to the other interested parties; Sefton Council, Highways England and the Liverpool City Region to independently explore other funding avenues in order to increase the existing budget to make a tunnel option, for instance, affordable. In doing so, they offered the example of Dublin Port Tunnel, whereby cars are required to pay a toll to use it, but HGVs are free. The project was funded by the Irish Government and Dublin Port is state-controlled. It’s the perfect example of how similar schemes can be funded in creative ways. Innovative and successful thinking by all concerned. If only we had the same here. However, time after time Peel Ports told us that this is simply not their problem to solve. The words of a private, commercial company. It’s what we have to expect. Peel Ports repeatedly pointed to the fact that, according to analysis by UK Traffic Data, HGV traffic represents just 10% of the traffic flow on the A5036 corridor and that there are wider issues to be tackled around existing, excessive car use, public transport and the promotion of cleaner vehicles. This may well be the case and Rimrose Valley Friends would support all initiatives which help to reduce car use and move people to an improved public transport system. The problem is these aren’t forthcoming. Or at least, not at the rate we need them to be delivered in order to address the problems our communities – specifically those around the A5036 corridor – are experiencing today. So, all the time this isn’t happening, the lazy, short-sighted, default option of “building another road” is the only action being pursued. We repeat: the only action. We discussed the variety of different, or “multi-modal” solutions to moving freight around the region and the country, including rail and waterways, but as we’ve heard elsewhere, Peel Ports said there will always be a huge proportion of goods – up to 75% – which need to be delivered to the local vicinity, where road transportation is the ‘only solution’. However, this is of course based on an assumption that there is no intention or desire to link the Port to the motorway network by delivering a rail, or even a tunnelled rail solution that would achieve this. Has any work been done into making the existing, disused rail tunnels viable? The fact of the matter is, if the desire was there, all of the players involved, including Peel Ports could strive for better solutions to this problem. We maintain that Peel Ports could use their considerable position and influence to apply pressure to the UK Government and Highways England to go back to the drawing board and push them to come up with better solutions which work for both Peel Ports and for residents of the area in which it makes its money. We believe this is possible because it was the UK Government itself who appointed Peel to run the Port of Liverpool and it is they who have instructed Highways England to deliver a road-based solution to support its expansion. We challenged Peel Ports to begin this process with our local MPs. In turn, they advised that although they are already in dialogue with Peter Dowd MP and Bill Esterson MP, they have agreed to disagree on the issue of the road, as both MPs support calls for a tunnel and/or greater use of rail freight. There is currently no dialogue on this matter with Steve Rotheram the Metro Mayor. This came as no surprise to us, given his public silence on the A5036 Scheme and our campaign, in particular. We sincerely hope that Steve Rotheram, or at the very least his representatives, read this. His indifference and apparent complete inability to form an opinion on a matter that was a key part of his manifesto is, frankly, staggering. The challenge we now face is that, as public opposition to this road grows louder and louder, no one is taking responsibility for it and each organisation has started to pass the buck. The UK Government – Champions of Air Quality and Protectors of the Environment – defers any questions on the scheme to their agency: Highways England. Highways England, who chose to name their project the “A5036 Port of Liverpool Access Scheme” something they no doubt regret and interestingly, something that Peel Ports also take issue with, now claim that it is being delivered to cater for “future housing and business growth” including the increase in road freight that the Port’s expansion will bring. Not having a change of heart, are they? For their part, Peel Ports claim that, as only 10% of traffic on the existing A5036 corridor is Port-related, the road is required primarily to address the existing issues being experienced in South Sefton. All of this begs the question: Who exactly is this road for and why is it being built at all? If the answer to today’s problems is simply greener vehicles, improved public transport, a concerted push to move people out of their cars to improve traffic flow and to clean up the air for everyone in South Sefton, why isn’t this taking precedence? And why isn’t the proposed £250 million being spent on these types of initiatives? Or, is there a wider agenda to this road development that the public is simply not being told about? Throughout our discussions, Peel Ports were at pains to point out how much they contribute to the region, through trade, jobs and apprenticeships. They wish to be seen a positive force within the community. However, when representatives from that very community ask for their help, it falls on deaf ears. A final thought to end on. We were told that if the outcome of the Judicial Review is that Highways England has to go back to the drawing board and that the current scheme may be abandoned, Peel Ports would look to get involved in exploring other options and to collaborate with the community. In other words, Peel Ports will investigate better options only if they have to, in order for their taxpayer-funded transportation route to be implemented. The words of a private, commercial company. It’s what we have to expect. It’s what we’ve come to expect. It’s what we have to fight against, together.